To celebrate Black Friday and Cyber Monday, I'm offering 20% off everything in the shop! Because I'm late to announce here, I'm extending the discount for my readers through Wednesday. Click the "Shop" tab to be taken to my Etsy shop. At checkout use code "Insider" to receive the 20% off. Hope you all are having a great start to holiday shopping! My baby has been fighting sleep for the last few days and I'm in motherhood survival mode armed with red wine and leftover Halloween candy. I've been fortunate to have a great sleeper and he's been sleeping through the night (give-or-take a middle of the night feeding) since about week 3. But, every few weeks I'm kept on my toes with a change in behavior. It's definitely a test of patience and I try my hardest to keep my cool given the lack of sleep. Thank goodness for coffee and under eye concealer. Both of these have saved me through these trying days! Speaking of, I haven't gone to Starbucks in a couple weeks but I have seen that the much anticipated holiday cup has returned! Have you been recently? I swear, the coffee just tastes better in a festive cup! I try to fight all Christmas urges until the day after Thanksgiving but I have to admit, it gets harder every year! I'm so tempted to just go for it- decorate, binge the holiday Hallmark movies, listen to ALL the Christmas music, and let the baking begin! But I'm staying strong, after all, I only have 10 days to go until after Thanksgiving! Which also has me thinking about the Black Friday/Cyber Monday deals quickly approaching. I'm working on getting my holiday gift list organized so I can shop strategically this year! Is there anything better than saving money on something you were planning to buy anyway? I've been a little absent from this space. With working full time, running my Etsy shop on the side, being pregnant, and now as a new mother, life has definitely been busy! My style of cooking has shifted to making recipes that are familiar and uncomplicated. I'm lucky if I have the time to take a "glamour" shot (aka quick iPhone pic) for Instagram let alone post a step-by-step for this blog. However, I've found myself missing this little peaceful place I call my blog. Writing, creating, and cooking is therapeutic for me. 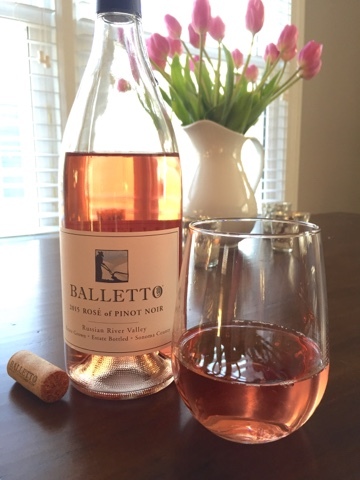 I love hearing from readers that they tried a recipe and liked it! My goal is to dust off the cobwebs and start posting helpful content again. My photos are not professionally staged or edited with fancy software but they are apologetically real. So much of my social media feed these days are very far from that. It's impossible not to compare how clean their houses are or how well they are put together (how does that new mom have time to bathe herself, style her hair, wear heels, and put on a full face of makeup?). I've recently found myself drawn to influencers that are keeping it real. Life is messy and it's refreshing to see the pile of laundry in the background or a plate of food that's actually being consumed. 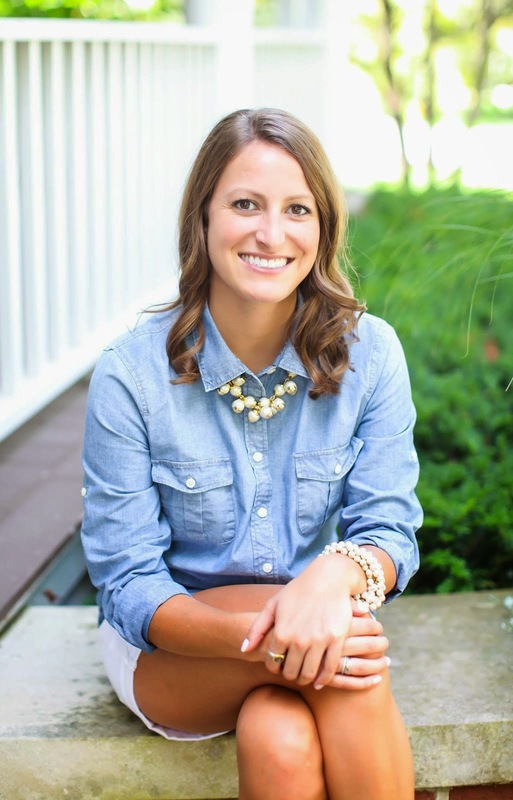 When you come visit, you can expect to read about what I'm into, motherhood, and food. 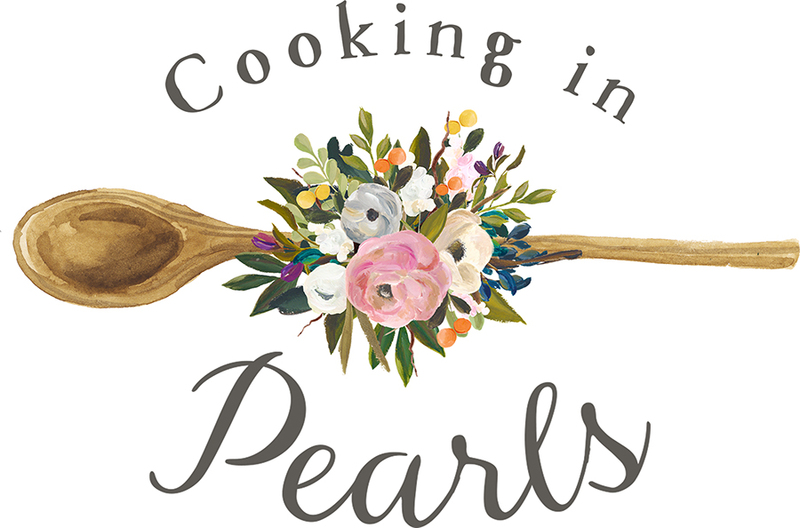 Recipes I create, recipes I've found and love, tips I swear by, and places I've eaten at. Cheers to an updated place to hangout with me! I've been extremely MIA around here but it's not for nothing, I have an exciting update! I've been busy creating products the last several months that are officially for sale! I have been scouring the market for products like these and when I didn't find what I was looking for I decided to create my own. I'm so excited to hear your feedback and hope you'll love them as much as I do! These are great to gift for bridal showers, wedding gifts, even hostess gifts. I have plenty of additional items I'm working on and will keep you updated when new items hit the shop. You can start shopping in the "shop" tab on the top of the page. I had a new recipe I wanted to try and skimmed it only to find I had everything on hand except for buttermilk. To be honest with you, I rarely even have milk on hand because I always end up throwing away a full carton. I guess we aren't big milk drinkers but I always think it's something one should have on hand. Nevertheless, I needed buttermilk and the only thing I had on hand was Greek yogurt. I did a bit of research and apparently it's a perfectly acceptable swap for baking. Use equal parts Greek yogurt and water (whisk together until smooth) to create a very similar consistency to buttermilk. If you need 1 cup of buttermilk use 1/2 cup Greek yogurt and 1/2 cup water to create your full cup. The other alternative that I use often is milk and lemon juice. I use about half of a lemon and squeeze the juice right into the milk. Give it a stir and let it sit a few minutes. You'll see it separate and that's totally normal! I love these types of swaps! Sometimes I don't want to buy an ingredient that I know I'll only need a small amount because it seems wasteful. If I do buy the ingredient I try to play "Chopped" and think of a way to repurpose it for other meals that week. Otherwise, I'll swap for something I will use or have on hand already. One of my favorite things about summer is being able to eat s'mores at every opportunity possible. It's like the calories don't count because it's just a necessary summer treat! Because I don't have a fireplace or outside fire pit I'm limited to the traditional roasting s'mores and love trying new ways of consuming them. 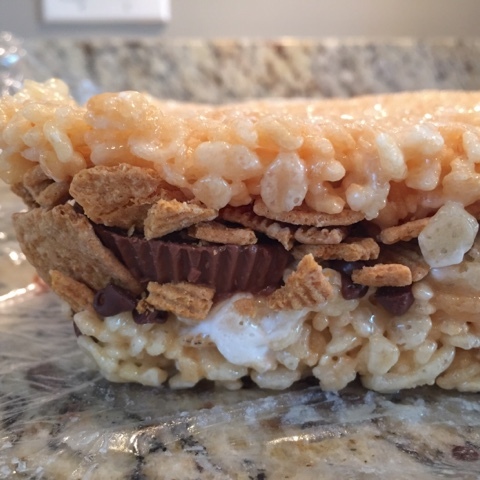 A method I've been thoroughly enjoying lately is S'mores Rice Krispie treats. I've made them a few different ways and you can decide what you prefer. There really isn't a right or wrong way to make these and I'll be honest with you, I didn't exactly measure the good stuff, aka the s'more part. Just eyeball it...you'll pretty much want every inch of it covered with the chocolate and graham cracker goodness. 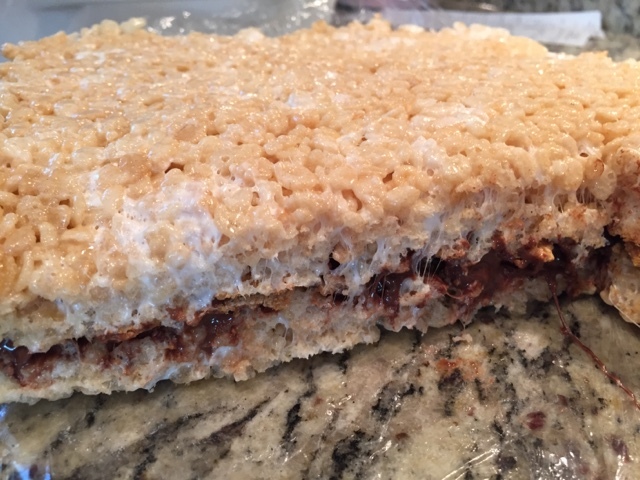 To make the Rice Krispies I followed the recipe (here) which made a delightful base. Actually...I may have added a whole stick of butter, not 5 tbl. It felt unnatural to leave such a small amount behind! I like this recipe because there's little bits of marshmallow that melt and give that luscious pull when you bite into it. Holy moly. 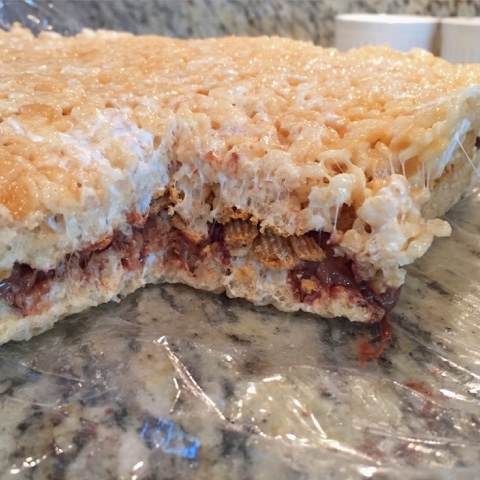 Follow your favorite recipe for rice krispies treats and add in mini marshmallows to the coated cereal mixture. Line your baking dish with the plastic wrap and give it a light mist of nonstick spray. Pour half of the cereal mixture in the baking dish and reserve the rest in the pot, for a quick second. Work quickly because you want the mixture to still be warm! Press the mixture lightly into an even layer, don't compact it too much. Add in the chocolate chips first and you'll see them melt almost immediately! Next break off the Hershey's squares and arrange them evenly around. Taking the graham cereal in your hand, lightly crush them as you sprinkle them on top. Use as little or as much as you like. Eyeball it! Pour the rest of the marshmallow cereal mixture over top and even it out, again, not pressing too much. Keep them light and airy. Let the bars sit for a half hour or so (if you can wait) and pull the plastic wrap up and out to cut the bars easier. I like the squares of Hershey because it's pretty much traditional but I also like to sprinkle on a layer of mini chocolate chips because they melt and ensure that every bite will be equally as chocolatey. You can also throw in different forms of chocolate in between such as peanut butter cups and let me tell you...it's a must try! 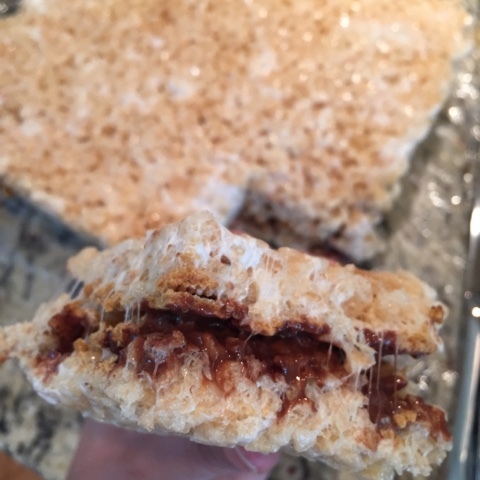 I made these a few times with the s'mores part on top and tossing it in the broiler for a few second to toast the marshmallows. 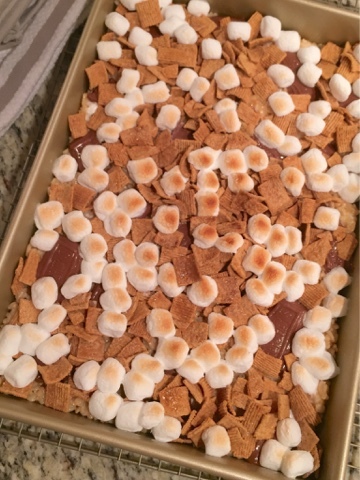 This way looks super cute and screams S'mores! I did find they were a little harder to eat. These are what S'more dreams are made of!